Everton produced a thrilling performance to defeat the current Serie A champions and major European super power Juventus. After the 90 minutes ended all square, Everton won a dramatic Penalty shoot-out to progress in the ‘Championship bracket’ of the International Champions Cup. The Roberto Martinez era is in its infancy, but the former Wigan Athletic manager has already demonstrated his tactical nous in the opening pre-season fixtures and on this occasion he out thought Antonio Conte to stun the Italians who were fortunate to come out of the 90 minutes all square. Martinez has already spoken of his desire to ensure that Everton have a flexible approach to games and after trialling the 3-4-3 formation in the second half at Blackburn, he decided to match the tactics of the Bianconeri and play with three at the back. The main surprise in the starting selection was young John Stones, who was chosen ahead of the experienced Johnny Heitinga to line up alongside Everton’s regular centre halves Phil Jagielka and Sylvain Distin. The England u20 defender was signed by David Moyes in the January transfer window, joining the Blues for an initial fee of £1.5 million which could rise to as much as £3 million. Ironically, Stones had been set to join Martinez at Wigan until Moyes made a last gasp move to convince the former Barnsley defender that his future was best served at Goodison Park. Stones was hugely impressive for the entire 90 minutes, comfortably containing Tevez and Llorente and producing two brilliant pieces of goal saving defence when called upon in the second half. The Blues were easily the better team in the opening 45 minutes, although there remains room for improvement in terms of retaining possession when placed under pressure by high quality opposition. Darron Gibson struggled to impose himself on the game in the same way he has in the previous three games and as a result Everton were forced to stretch the play at times. Alongside Gibson, Fellaini produced his best 45 minutes of the summer, closing and harrying the Juventus midfield who struggled to cope with the towering Belgium. Everton thought they had opened the scoring in the opening 10 minutes. A hopeful cross into the box from a Pienaar free kick avoided everybody and nestled in the far corner of the Juve goal. Unfortunately for the Blues the linesman had his flag up for offside against Phil Jagielka who had run across the ball from an offside position and the goal was correctly ruled out. Everton went close again, this time from young John Stones who directed another free kick onto the post of the Juventus goal. The lack of changes at the half time interval reflected how seriously Martinez was taking the fixture and his happiness with the Blues’ opening performance. Juventus had clearly received a wake-up call during the break and produced a much improved performance in the second half. Everton however matched their illustrious opposition and deservedly took the lead through Kevin Mirallas. The flying Belgium was enjoying his performance by this time and when Gibson broke away, after good play from Anichebe, he directed the ball wide to Mirallas in acres of space. Mirallas ran at his defender, cutting inside before firing past the Juve keeper and into the net to put Everton one-nil in front. Everton should have doubled their advantage when a mistake from the Juventus backline presented Pienaar with a glorious opportunity, however with just the keeper to beat; Pienaar directed his shot wide of the far upright. Everton were made to pay for their profligateness in front of goal when Juventus equalized inside the final 10 minutes of the match. Everton had up to that point defended heroically, but a ball across the box was miss-controlled by substitute Leon Osman and the ball fell perfectly for Asamoah to drill home from the edge of the box. With the game edging towards penalties Everton did have one final chance to win the game, young Ross Barkley creating space for himself before firing a fizzing shot towards goal, but Storari in the Juventus goal collected the ball at the second attempt. It therefore took penalty kicks to decide who would progress as winners and as always the spot kicks produced much drama. 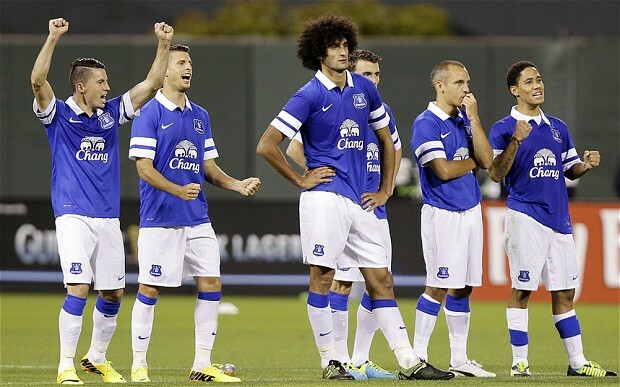 Leon Osman missed the opening penalty for Everton before Barkley, Mirrallas, Jagielka and Oviedo all calmly scored. With Juventus converting their first 4 kicks the mercurial Pirlo was left with the opportunity to win the tie but he pulled his penalty wide and Everton took full advantage. Young John Stones brilliant scored the first sudden death spot kick as did Motta for Juve. Seamus Coleman slotted his home leaving Tim Howard to save Peluso penalty and secure victory for the Toffees. Another quite brilliant game for the Blues and the prize for victory should be an equally prestigious tie against Real Madrid in the early hours of Sunday morning. Team: Howard; Stones, Distin, Jagielka; Coleman, Baines (Oviedo), Gibson (Osman), Felllaini; Mirallas, Pienaar, Anichebe (Barkley). Penalties: Osman (missed), Barkley, Mirallas, Jagielka, Oviedo, Stones, Coleman.